The High Line or The High Line Park is a New York City linear park built on an old, unused elevated railroad line. The park is 1.45 miles long and it runs from Gansevoort Street – a couple of blocks below 13th street – to 34th street. The best thing about the High Line is that is absolutely free! It is a park after all, but it is a pretty cool park. You get to walk above the crazy New York City streets and between its buildings, and get to see the city from a different perspective. It is also a great place to just sit and people-watch. New York City’s High Line is full of interesting characters that I don’t get to see on a daily basis. If you’re ever in New York City, I highly recommend you stop by the High Line… skip Times Square if you don’t have enough time. For those that live in NY or around the area, you should go and check it out now because they opened the new extension to 34th Street yesterday. Kate and I decided to go to the High Line yesterday because it had been a while since we were there. It was kind of cool that we went yesterday because it was the first time that the new extension was open. Prior to yesterday, the High Line was only opened up to 30th street. Now they have a pretty cool extension that goes west on 30th street and then turns up to 34th Street. We like to go to the High Line and just sit on a bench and look deeply into each other’s eyes and forget about the world around us… or we just watch people walk by. This time the High Line was more crowded than usual because it was the opening of the new extension and there was also the People’s Climate March happening not too far from there, which had a turn out of 400,000 people. Some of them made their way to the High Line after the protest – unfortunately, Leonardo DiCaprio wasn’t one of them. Anyways, we had a pretty good time just walking around the High Line and spent a couple of hours without having to spend any money. We did get pretty hungry though. There are a lot of cheap places to eat in New York, but you need to know where to find them. Dave at The New York Budget has a great list of Cheap Eats in NYC that you should definitely check out. Or you could get a Groupon. Kate had a Groupon for Le Souk, a Moroccan restaurant in Greenwich Village that was pretty darn good. This is a restaurant that I probably would have never tried because it was not the cheapest, but the Groupon saved us almost $40 on our four course meal. I’m not against trying fancy restaurants, I’m just against paying full price for the meal (we still tip on the full amount, of course). 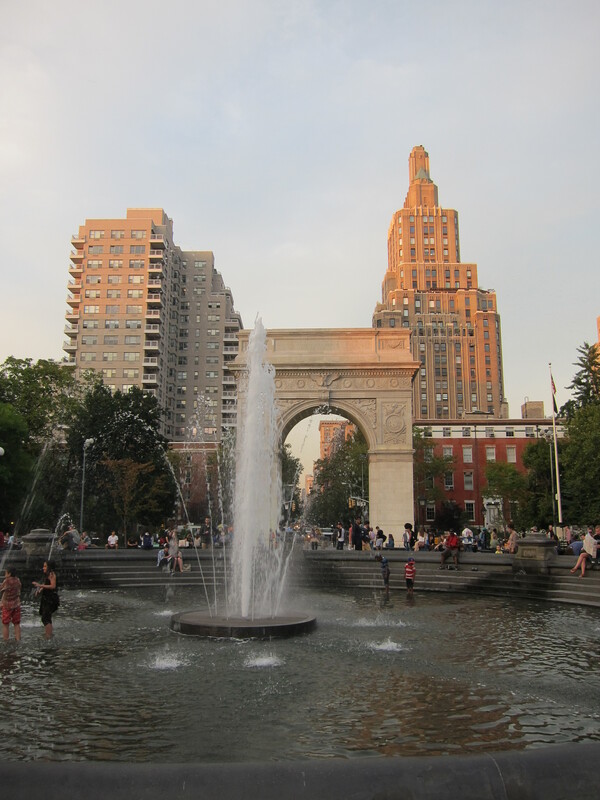 Since we were already down in the Village, we had to pass by my favorite NYC park, Washington Square Park. I love WSP because it is always full of life. There’s always music playing and people just having a good time. In the many times I’ve been to Washington Square Park, this was the only time that I saw water in the fountain, which was pretty fun to see. Like I said, there’s always something cool to see in WSP, and this time was no different. They had a few couches in the park for free conversation! Just some couches where you sit and have a conversation with strangers. How cool is that? Lonely? Just have a seat! New York City has a lot of awesome things to do and see, but my favorite thing about New York it’s all the different people that walk around its streets every day. It’s cool to see all the different personalities, styles, and attitudes that visit New York. NYC is definitely a cool place to go, but try not to get trapped on the touristy areas/restaurants – Times Square, ahem, ahem – and just ask the locals where they like to go. They might seem like they’re in a rush trying to get somewhere, but they’re not as mean as people think. They’re just trying to get away from the crowds, that’s all. If you’re ever planning a trip to New York, feel free to ask me for some tips and suggestions. 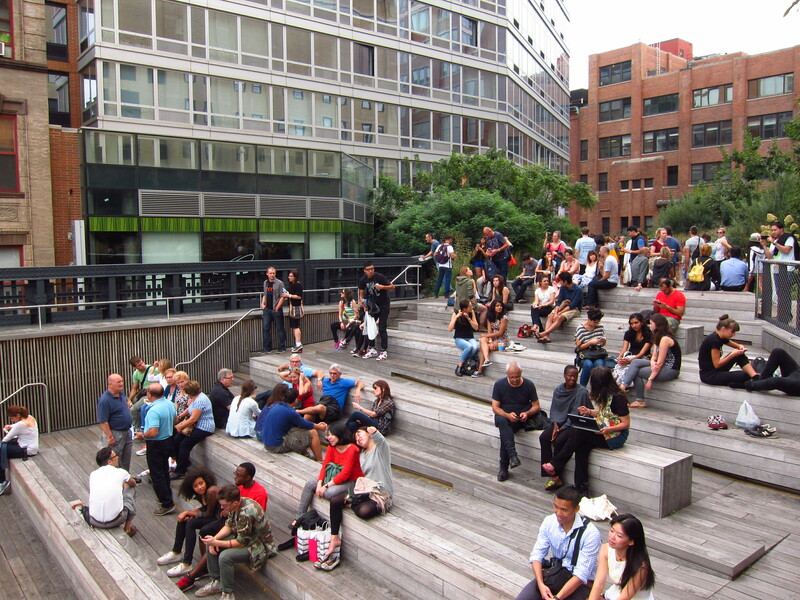 Have you been to the High Line? What are your favorite frugal dates? I’ve never been to the High Line but heard a lot about it- it looks really cool! Also, those couches are hilarious. Not sure I’m ballsy enough to sit down on one and start chatting with strangers, though! HA. The High Line is indeed pretty cool. As for those couches, I didn’t sit there either. It was still very cool that they’re doing that though. The high line is one of my favorites! I have been looking forward to hitting up the new section that just opened. Glad it was awesome! Yes, the new section is worth a look. They did a nice job. Thanks for the High Line tip as I haven’t gone there yet. I’ll definitely share this with DH as a to-do when next we find ourselves in Manhattan. I’ve never even heard of the high-line, so this was super informative. Not sure when I’ll next visit NYC, but I’ll keep this in mind! Love that you got such a great discount on your meal, too! Kirsten recently posted…Trouble Comes in Threes… Right?!? Love the conversation couches! People watching is so fun, too! Those sofas are so cool. I am too shy, so I probably would only watch the action with longing. When I think of NYC – I think big $, but it looks like there are lots of things to do that don’t require big bucks. I love going to the high line! And I love Moroccan food so I will have to look out for a Groupon to that place. I have been hit or miss with my Groupon restaurant choices, so I always love when I hear that places are actually cheap and good. I wanted to get to the High Line as it looked really neat, but I never went there. It’s awesome Kate looked to Groupon to get a deal on some food! I need to check out Groupon more often. I haven’t been to the high line, but now I really want to go! You should, it’s really nice. NCY is way fun! Only been a couple of times with my wife when she lived in New Jersey but thoroughly enjoyed my time there. Our favorite frugal date/activity is probably walking in the park or watching a movie on Netflix. Brian @ Luke1428 recently posted…My Very First Rant: Change Your Mattress Every 5-7 Years? You can’t beat a walk in the park as a completely free date. We like going to the park and just laying on a blanket and reading a book. I’ve never been to the High Line, but the pictures really look awesome! And that couches in the park for free conversation is really amazing! The couches were indeed pretty cool. What a neat idea! I totally agree with you, people watching is really is a great frugal activity. Liz recently posted…Versatile Blogger Award – Seven Random Facts About Me! There’s a lot to do, but it doesn’t have to be overwhelming. Just go and do what the locals do and stay away from the tourist traps. I think that’s true anywhere you go. I have never heard of this. I do so want to go to NYC soon. I have a goof friend up there so all I would have to pay for is the transport and my food expenses. Its interesting tips like this that make me want to go more. I know NYC can be so expensive for lots of things but I know there are lots of gems like these for free. Debt and the Girl recently posted…Are You Richer than the Average Millenial? You should definitely come if you have room and board. You should visit the greatest city in the world at least once in your lifetime. Laurie @thefrugalfarmer recently posted…A Plutus Award, A Versatile Blogger Nomination and a Big, Hearty Thank You! 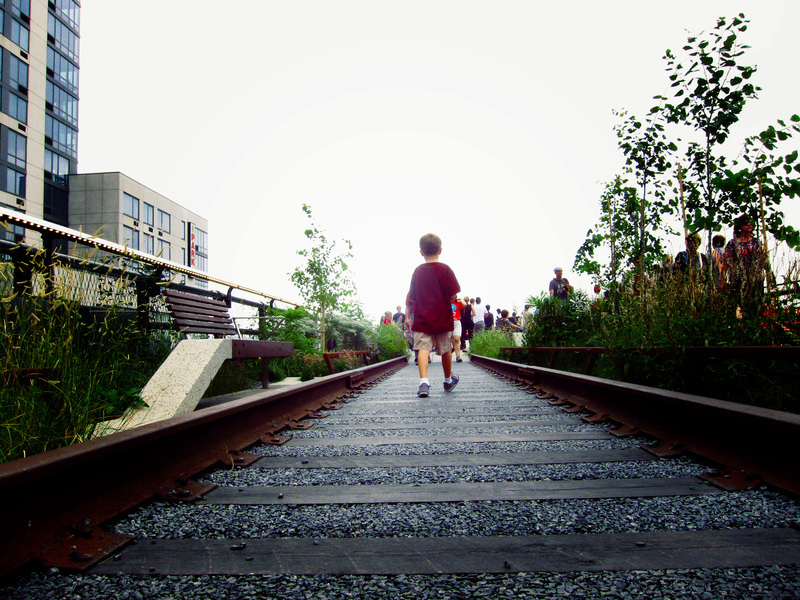 Highline is beautiful…what a great idea for using it as a park. They are thinking about doing that here in Queens for LIRR train tracks that are no longer in use, but there is no funding for it. A lot more money for Manhattan projects of course! You should start a kick-starter campaign for it. I would contribute. We missed this when we were in NYC the first time (but definitely not the last time!) I wanted to do it but we’ll have to add it to next trip. Definitely check it out next time you’re around these parts. You won’t be disappointed. I saw the High Line on the news one day and think it is an awesome idea. I am glad you take advantage of such the place. Enjoy and thank you for sharing.